When I was in elementary school, I used to get free lunch. For those of you who might not know, free lunch was pretty much a big label on your forehead proclaiming "my family is too poor to pay!" I was always so embarrassed and would insist on having my mom pack lunch instead. When my dad finally landed a corporate job and we made too much money for me to freeload off the public school system, I changed my tune and instead wanted to buy lunch every day. No longer did I want my mom to pack "embarrassing" asian lunches since all the kids at school were eating chicken strips or pizza or spaghetti with meat sauce. I was a pretty dumb and impressionable kid, but weren't we all? Back then, I remember thinking spaghetti with meat sauce was so luxurious. It was a special treat whenever I had it at school. In hindsight, it was probably pretty gnarly, but I still recall it tasting good, most likely because I perpetually have on those nostalgic rose colored glasses that romanticize most memories from your childhood. The first time I made bolognese I remember thinking that this was just a fancy pants version of the stuff I ate as a kid...only, it was so so so much better. This dish is one of those things that's amazingly simplistic to make, you just have to start early in the day to finish in time for dinner. Either that or make it a day beforehand, which is what I usually do. Whatever you choose to do, your patience will be rewarded in the end. 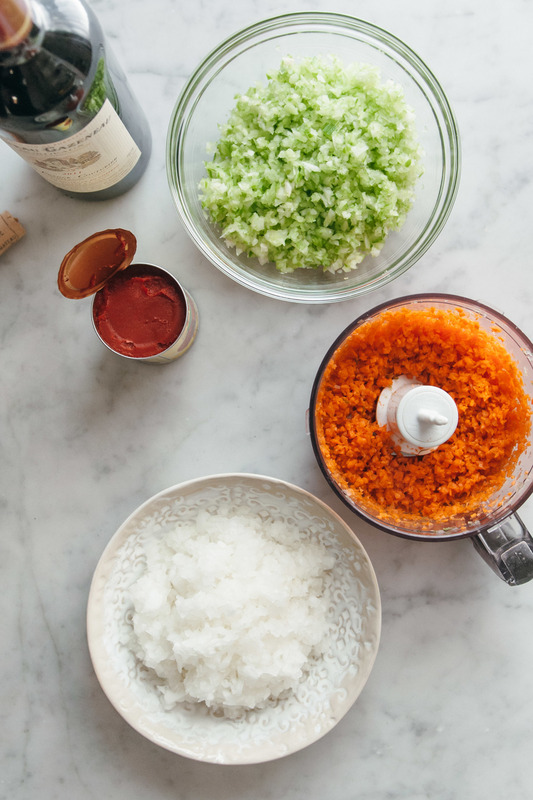 Don't rush bolognese, it's gotta go low and slow for a few hours to really bring out the flavors. If you don't have that kind of time (around 4 hours), I recommend making it another day. 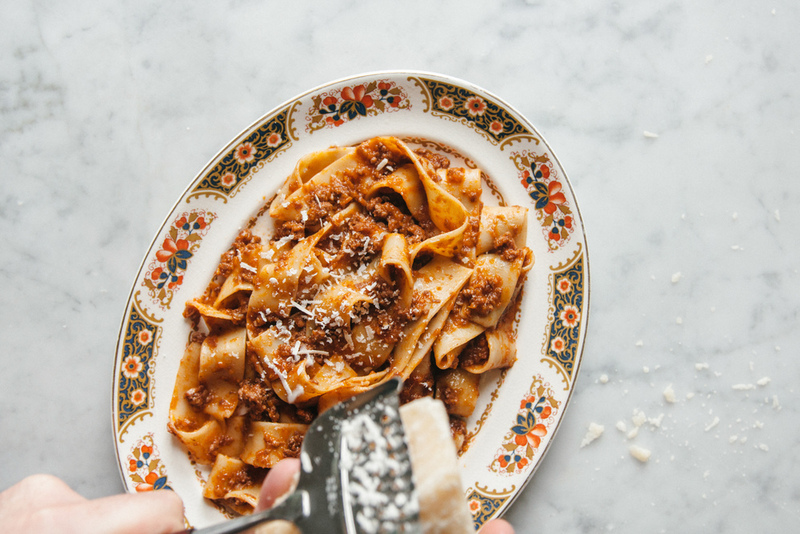 Bolognese sauce usually calls for milk to tenderize the meat. Make sure to add it right after the meat is cooked as the recipe instructs. If you forget, then just omit it. But whatever you do, do not add the milk after you've already added wine and/or tomato paste. The acid will make it curdle. Take it from a girl who's made this mistake before. In a large dutch oven, heat up olive oil over medium high. Add onions, celery, and carrots. Cook for 8 to 10 minutes until soft and translucent. Add beef, pork, and pancetta. Cook for 10 to 12 minutes, breaking up any big pieces with the back of your spoon, until the meat is no longer red and has starting releasing its fat. Liberally salt and pepper the mixture and stir to incorporate. Add milk and nutmeg, give it a good stir, and cook until milk has evaporated, about 15 minutes. Add wine and cook until reduced by half, another 10-ish minutes. Finally, add tomato paste, beef broth and stir until combined. Turn the heat to low and cook at a very low simmer for the next three hours, stirring occasionally so the bottom does not scorch. Add additional beef stock as necessary if the sauce starts drying out. When it's done, it should not be watery as most of the liquid will have cooked down. Boil noodles in a pot of well salted water until al dente and finish them off in the bolognese sauce. Serve with some freshly grated Parmigiano-Reggiano.